IntoxiKate.com is an interactive platform designed for fellow foodies based in Westchester and Fairfield counties. The posts go far beyond recipes and recommendations—IntoxiKate creates an environment where foodies can truly “play” with their food. Through the Fork This with IntoxiKate radio show, events, tastings, online magazines and social media, foodies can interact with chefs, taste the latest culinary trends, and fall in love with new restaurants. It’s all about living life deliciously! IntoxiKate.com was voted the best local lifestyle website in Westchester by the readers of Westchester Magazine in 2014 and 2015. Kate Schlientz’s professional track is rooted in journalism. Shortly after graduating from the Newhouse School of Public Communications, Kate traveled to the tristate area to work with local publications produced by The Journal News. She moved on to design and write for Woman’s World magazine, while freelancing for several publications including Westchester Magazine, The Journal News, The Bridal Book, InTown Magazine, and Project You Magazine. With an invested interested in content and creative production, Kate worked with Bruckner Design, Inc, a creative marketing agency based in White Plains, NY, to create campaigns through traditional and new media formats. In this role, she worked with companies such as Wine Enthusiast, CFGroup, PRG RH+A, Amscan, and more, creating materials for both social media and print applications. 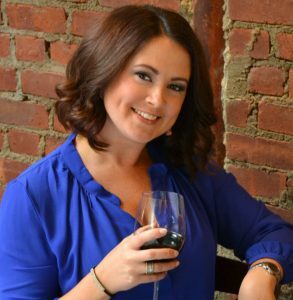 In 2013—with her love for food, wine, and spirits in mind—Kate launched IntoxiKate.com, a website committed to connecting fellow foodies to the best food, events, and restaurants in Westchester and Fairfield counties. Shortly after its launch, IntoxiKate became a vehicle for food events, connecting restaurants and chefs with diners in new, innovative ways. IntoxiKate.com was voted Best Local Website in 2014 & 2015 by the readers of Westchester Magazine. Fork This with IntoxiKate, Kate’s weekly talk radio show, currently airs on 1490 WGCH and is also available as a podcast. Adding one more job to her roster, Kate is also an adjunct professor at Iona College (New Rochelle), teaching social media, public relations, and marketing to graduate students.